The right message, at the right time, to the right person - the fundamentals of digital marketing today. Would you believe this also applies to recruiting employees? Jobvite’s 7th Annual Social Recruiting Survey shows that much like marketers, today’s recruiters must showcase their employer brand and engage with candidates across many platforms. 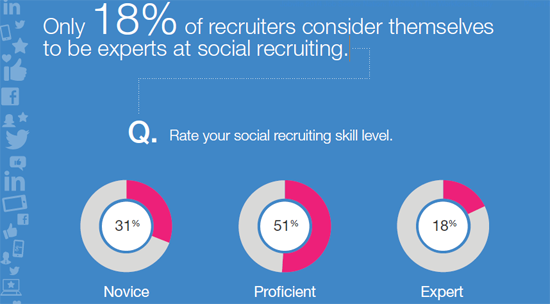 In fact, according to the survey, 73 percent of recruiters plan to increase their investment in social recruiting in 2014. What’s more, 55 percent of recruiters use or plan to use a mobile career site to support recruiting efforts. Finally, recruiters are targeting and personalizing their strategies by now reviewing social profiles to uncover mutual connections and evaluate written or design work. LinkedIn remains the number one recruiting network, followed by Facebook, Twitter and a candidate’s personal blog. Despite social’s clear influence on recruiting today, only 18 percent of recruiters consider themselves to be experts at social recruiting. For jobseekers, the trends showcased in Jobvite’s annual survey should encourage them to run, not walk to clean up their social profiles. Recruiters will view a candidate negatively if his or her social profile includes such things as profanity, spelling/grammar mistakes, sexual posts, alcohol, guns, etc. Recruiters will view a candidate positively when their social profiles include volunteer/donations to charity.